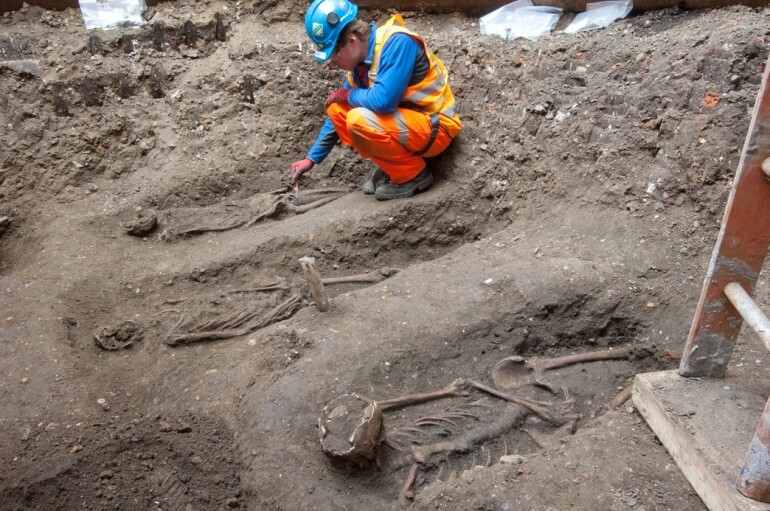 Jam jars and plague pits – 8,000 years of London life explored in new Crossrail archaeology books - Crossrail . For information about the Elizabeth line please visit the Transport for London website. The archaeology and heritage of London discovered by the Crossrail programme, is explored in five new books released today by Oxford Archaeology and MOLA (Museum of London Archaeology). Since Elizabeth line construction began in 2009, more than 200 archaeologists have unearthed over 10,000 objects from 40 locations, spanning 55 million years. The findings of the archaeology programme – the biggest ever undertaken in the UK – are now being published in a series of 10 books. Jay Carver, Crossrail Lead Archaeologist said: “The construction of the Elizabeth line, east to west through London, has given us a once in a lifetime opportunity to explore some of the capital’s most historically significant areas. The final three books in the series, unveiling the discoveries made during the excavation of Roman and 17th Century burial grounds at Liverpool Street, and the buried prehistoric landscapes of east London, will be published in spring 2017. Books looking at a Tudor moated manor house in Stepney Green and the great London shipbuilders, ‘The Thames Ironworks’ were published last year. A wide range of artefacts and fossils unearthed by Crossrail will go on display in a major new exhibition at the Museum of London Docklands from February to September 2017. Visitors will be taken on a site-based journey, following the map of the new Elizabeth line, revealing the stories of Londoners ranging from Mesolithic tool makers and inhabitants of Roman Londinium to those affected by the Great Plague of 1665. The books are supplemented by Crossrail’s Fieldwork Reports - extensive technical papers that provide a much greater level of detail and further information on the excavations and their findings. All the Fieldwork Reports are available on Crossrail’s Learning Legacy website.